George Walker, chair of the Scottish Housing Regulator has written a blog update on the state of play with the ongoing review of the Regulatory Framework. In October 2014, SFHA published a guide for Governing Body Members, as a result of a suggestion from the Federation of Local Housing Associations in Renfrewshire and East Renfrewshire (FLAIR) who contributed to its content. The guide is a model that can be customised to suit individual RSLs and provided to Governing Body Members (GBMs) to help them in their role. It is especially useful for new GBMs. Following some minor amendments logged by Scottish Government at Stage 2 (see here), the Housing (Amendment) (Scotland) Bill has reached Stage 3 in the Scottish Parliament. As anticipated, Scottish Government has lodged two amendments at Stage 2 of the Housing (Amendment) (Scotland) Bill. These were to take account of recommendations made by the Local Government and Communities Committee report at Stage 1. The SFHA and GWSF commissioned TC Young to develop some model documents to aid in members as they look to implement the requirements of the General Data Protection regulations (GDPR). This guidance is now available for SFHA and GWSF members. In October, SFHA met with the Scottish Housing Regulator on two occasions regarding forthcoming SFHA guidance. The SFHA commissioned Caron Quinn to produce sector specific guidance on Internal Audit. 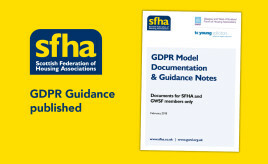 SFHA is delighted to make this comprehensive guidance available to all SFHA members. An SFHA briefing on the Regulatory Framework review is now available. This includes templates for submitting comments on various aspects of the review to SFHA, to help shape our response. Chairs Conference 2019 - Programme announced! SFHA Chairs Conference, 1 & 2 February 2019, DoubleTree by Hilton Westerwood Spa & Golf Resort. Unfortunately, due to a low number of bookings, we have had to cancel the scheduled SHR round table discussion event on 28 November in Aberdeen. Having already held an event in Glasgow, SFHA is holding two more free consultation events in Edinburgh and Aberdeen. The Minister for Parliamentary Business and Veterans has confirmed to SFHA that - whilst the intention of the Scottish Government is to proceed with extending Freedom of Information legislation to RSLs - due to continuing consideration of issues raised in consultation, including the timing of the order, the proposed commencement date of 1 April 2019 is no longer considered feasible in allowing sufficient time for RSLs to prepare for designation. A commencement date will be confirmed in Scottish Government's formal response to the consultation. 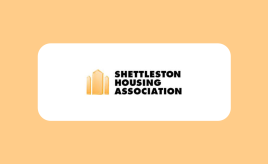 Shettleson recently had a well attended AGM which saw the appointment of seven new members to the association's committee. Cairn Housing Association has seen a further strengthening to its Board with three new members appointed at their AGM earlier in September as part of their succession planning.